We have modified the search fields in the U.S. Congressional Documents collection to allow you to add a specific date to your search query using a section date field. This is especially helpful when searching the Congressional Record. This will allow you to search on a specific date and/or a specific page for a word or a term. To illustrate this, let’s search for the Senate Amendment to H.R. 4986 on page 26099 as it appeared in the House of Representatives proceedings on November 14, 2000. It's been a busy month for the HeinOnline Development Team. Outlined below are a number of enhancements that we added to the site and released this morning with the monthly content release. Don't hesitate to contact us if you have any questions or feedback about these enhancements. We have added the ability to run a search across different libraries. This feature has been added to the search results screen. Let's use an example to illustrate how this works. Are you looking for a specific document within a Federal Legislative History, such as a Committee Report, the text of a Public Law, or a Congressional Record document? This tip will walk you through locating a specific document by building a simple field search in HeinOnline’s U.S. Federal Legislative History Library. Once you’ve located the document through a field search, you can then use the “Search Within These Results” feature to find a specific section within that document. HeinOnline's Tip of the Week: Looking for a case in the U.S. Supreme Court Library? Are you searching for a case in the U.S. Supreme Court Library in HeinOnline? Whether it’s an older case from the 1800’s or a case from the 21st century, this tip may help you find the case you are looking for without knowing the exact representation of the case name as it appears in the publication. HeinOnline's Tip of the Week: Looking for an Article in the Law Journals Library? Do you have the name and author of an article from a Law Journal, but do not know the journal name or citation and need to find it in HeinOnline? This week's tip outlines how to conduct a search for the article in 4 easy steps, starting at the Log In screen. Do you prefer to watch a live demo of this example? If so, head over to the HeinOnline YouTube Channel where we've uploaded a how-to video. This video is featured on our YouTube home page, so all you have to do is hit play. A Code of Federal Regulations Quick Reference Guide is now available in HeinOnline. This guide outlines the various options available for navigating this collection, from browsing to using the Title and Part Quick Locator, to searching for specific variables. If you often find yourself looking for a specific section of a part, check out the various search examples in the guide. 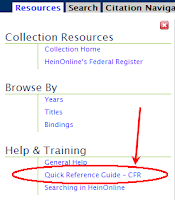 This guide can be accessed from the Educational Resources page or by clicking on the Resources tab inside the CFR library and then clicking on the link under the Help & Training section. It’s no secret! As Due Process, WisBlawg and ZiefBrief have all reported, Google Scholar is indexing the Law Journals in HeinOnline to make the more than 1,100 titles searchable in the Google Scholar interface. The indexing is still ongoing, as Google Scholar has not fully indexed all of the titles in the Law Journal Collection as of yet. Over the next 30 days or so they should near completion of the indexing at which point the entire HeinOnline Law Journal collection will be searchable in Google Scholar. Do you often run the same search when returning to HeinOnline for subsequent research sessions? Have you ever wanted to save a search and re-run it later to see if there are any new hits (especially after a monthly content release)? This week, we will focus on bookmarking your search query using your web browser features. This allows you to re-run a search query with the click of a mouse the next time you return to HeinOnline. Below are two short how-to videos, one illustrating this option using Firefox and the other using Internet Explorer.